It wouldn't be a fun day on the Internet without a straight shot of nightmare fuel to the heart. Today's dosage: an insane study on how spiders could theoretically eat every human on Earth in just a year, courtesy of the Washington Post's Wonkblog. WaPo pulls its findings from a study published in the academic journal The Science of Nature and written by European biologists Martin Nyffeler and Klaus Birkhofer. Nyffeler and Birkhofer wanted to calculate how much food spiders consume on a yearly basis. 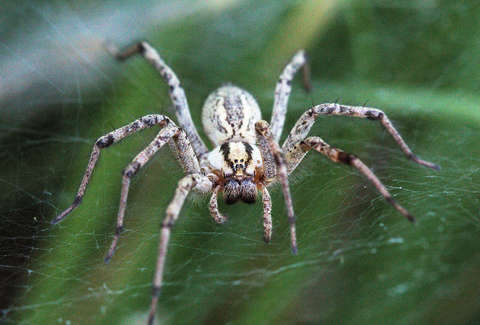 After crunching the numbers based on spider proliferation across habitable land on Earth and how much food spiders of different sizes eat every year, they estimated that spiders around the world consume between 400 and 800 million metric tons of food a year. That's a massive, unwieldy number, so let's put it in perspective. The total biomass estimate for all humans alive on planet Earth was 287 million tons in 2005 based on average sizes of people living in different regions. The world population's risen since 2005, sure, but humanity's total biomass still falls well short of the low end of spider food consumption. The scientists additionally found that there are about 25 million metric tons of spiders in the world, according to their research, they're one of the most prevalent species you can find on planet Earth. To put that number into context, the Star Wars films' Millennium Falcon starship could hold 100 metric tons in its cargo hold. It would take a massive star fleet of 250,000 Millennium Falcons to even consider transporting the amount of spiders we have on Earth anywhere else in the galaxy, and all of those spiders are really freaking hungry all the time. Per WaPo, spiders eat about 10 percent of their body weight every single day ("equivalent to a 200-pound man eating 20 pounds of meat each day"). This means Han Solo would have to also smuggle about 2,500,000 additional metric tons a day to feed them all -- at least.